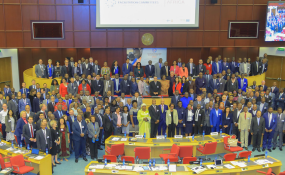 Participants at the 2018 African Forum for National Trade Facilitation Committees in Addis Ababa, Ethiopia. Better transport, logistics and foreign investment are essential to smooth the way for the African continent to reduce trade hurdles, according to the United Nations Conference on Trade and Development (UNCTAD). "Africa faces a moment when the market access gains that have been negotiated over the past two decades can be severely eroded unless we address the challenges of trade facilitation", said UNCTAD Secretary-General Mukhisa Kituyi on Tuesday, at the start of a three-day forum taking place at the UN Economic Commission for Africa (UNECA) in Addis Ababa, Ethiopia. The First African Forum for National Trade Facilitation Committees aims to implement the World Trade Organization's (WTO) February 2017 Trade Facilitation Agreement and tackle fast-shifting patterns of global commerce to help drive down trade costs. Amidst new momentum provided by March's landmark African Continental Free Trade Agreement (AfCTA), Mr. Kituyi emphasized that Africa's competitive labour advantage must be accompanied by quality transport hubs, more efficient cross-border goods and services movements, better port procedures and predictable logistics management. "If Africa is going to trade with itself, we have to make sense of what main roads and railways are to be built to connect African producers and consumers," Mr. Kituyi argued, stressing the need for well-functioning trade committees, infrastructure and investment. The WTO calculates that current trade costs for developing countries are equivalent to a staggering 219 per cent tariff on their international trade. According to WTO Director General Roberto Azevêdo, the reduction of trade costs with the Trade Facilitation Agreement is "striking." "It could add 2.7 percentage points per year to world trade growth and more than half a percentage point to world GDP [gross domestic product]," he stated. "The biggest benefits would accrue to developing countries." He revealed that African estimates indicate that by fully implementing the agreement, trade costs could be reduced by an average of 16.5 per cent, potentially delivering "a huge economic boost for the continent." The deputy chairperson of the African Union Commission, Thomas Kwesi Quartey, stressed that the continent needs real vision to make an African common market a reality. "To trade, you must first produce, and to be able produce and leverage science and technology in this production, you need education training and planning," he said. On behalf of UNECA's Executive Secretary, Ingrid Cyimana said that Africans were doing just that by taking steps to integrate their economies using the new Free Trade Agreement and by establishing trade facilitation committees. "Our projections show the value of intra-African trade to be between 15 to 25 per cent higher in 2040, compared to a situation with no AfCTA," she stated. The forum supports the WTO's agreement, which besides boosting trade also addresses improved revenue collection and security compliance controls.